Please feel free to call us, stop by the office or email us for more information. Exit Glades Road Exit #45. Go east about 2 miles (you will pass Florida Atlantic University). 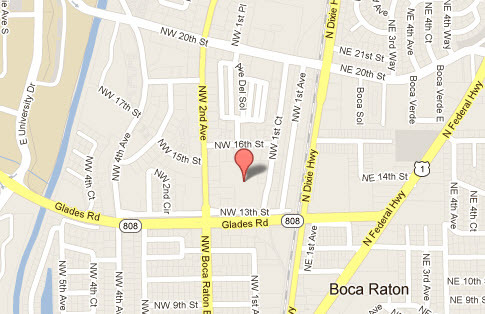 Turn left on NW 2nd Ave, also know as NW Boca Raton Boulevard. Immediately turn right onto the access road on the Glades side of the 7-11. Approximately 300 Feet later turn left into the Office Depot building parking lot. Pass the building on your right and continue straight for about 500 feet. The office is on your right, suite D26. Park in front. Come on in. Turn west (only way you can) on Glades Road (this is 12th street in Boca) and pass over the railroad track (this is about .25 miles.) Make the next right and an immediate left on the access road in front of the Office Depot. Make the next right into the Office Depot parking lot. Pass the building on your right and continue straight for about 500 feet. The office is on your right, Suite D26. Park in front. Come on in.